In the 1960s and 1970s, a lot of winning stock car drivers had one thing in common - a Cotton Owens-prepared Dodge. David Pearson, for example, first made a name for himself in the NASCAR Grand National Series by winning 27 races with Cotton Owens-prepared Dodges. Bobby Allison won at Birmingham International Speedway in Alabama in 1967 driving a Cotton Owens-prepared Dodge. Charlie Glotzbach won the National 500 that same year driving a Cotton Owens-prepared Dodge. And Buddy Baker won the Southern 500 at Darlington in 1970 driving a Cotton Owens-prepared Dodge Daytona. Owens prepared race cars for so many drivers he can't remember them all. A recent attempt to list them totaled more than 30 before the project stalled. "I'm sure there are more; I can't remember them all," said Owens. The ones he did recall could make up a good "Who's Who" of stock car racing. Among the well-known names are Mario Andretti, Ralph Earnhardt, A.J. Foyt, Pete Hamilton, Bobby Isaac, Junior Johnson, Richard Petty, Fireball Roberts, Marty Robbins and Al Unser, Sr. The first driver to win in a Cotton Owens-prepared race car, of course, was Everett Owens, who picked up the nickname "Cotton" because his hair was so white. He started his racing career driving Dodge Modifieds with six cylinder engines. "I actually was running Dodge before anyone back in the early 50s," said Owens. "We had a six-cylinder modified Dodge that was built by a mechanic in North Carolina. They were having driver problems and I told them I could drive the car. It was a very unique car to drive cause it had four springs and everybody used a flathead with two springs. "So we won something like 50 or 60 races that year with that car - it was 1950. It was a modified '37 Dodge coupe with a six cylinder Chrysler engine in it, and we raced all through the Carolinas. They called me "King of the Modifieds" because I won so many." Owens won enough races in 1953 and 1954 to win the national championship in the Modified Division. He also ran selected races in NASCAR's Grand National Division, and in 1957 he won his first race that premier division, a 160-mile beach race at Daytona. He had six more top-10 finishes that year, including a second place in the Southern 500. Before he hung up his helmet for good, Owens made 160 NASCAR Grand National starts over a 14-year period with nine wins, 11 poles and 52 top-fives. Owens decided to become a race car builder and owner for others after an accident left him with double vision. "I had a bad accident in 1951 that destroyed my vision partially," said Owens. "I still have double vision to this day, but I correct it through glasses now after four operations. But I was beginning to curtail my driving in 1961 and 1962 because my depth perception had changed quite drastically and I was either gonna run over someone or, you know, do something I shouldn't be doing because of the depth perception." One of the first to drive for Owens in 1962 was Junior Johnson, who became a legendary driver and car owner himself. The best finish for the Owens/Johnson combination was second at the Firecracker 400, then the summer race at Daytona International Speedway. That same year, Owens got together with fellow Spartanburg, S.C. resident David Pearson. They didn't win any races together that year but became incredibly successful later on. Their first win together in a Dodge came in the Richmond 250, March 10, 1964 at Atlantic Rural Fairgrounds. 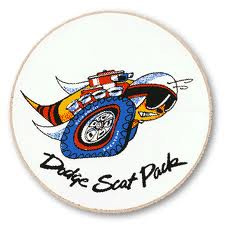 At that time, the track was a half-mile dirt oval. One of the most bizarre years Owens and Pearson spent together was 1965, the year Chrysler boycotted NASCAR in a dispute over the Hemi engine. New rules banned the engine and Chrysler was naturally unhappy about losing its competitive advantage. So without any circle track racing to do, Owens and Pearson went drag racing. Yes, drag racing. They ran a Dodge Dart station wagon with a Hemi engine in the back of it. The car raced in the Experimental class, burning nitro and alcohol. It set fast time at Bristol before Owens and Pearson happily returned to "round trackin'" in 1966. Their relationship as car owner and driver ended in the spring of 1967. While they are good friends now, Owens says they got to know each other too well back then. "I really got too close to him because we live here and went everywhere together," said Owens. "We just got too close. In racing, a lot of times things happen that you think are gonna happen and it upsets you; it works on your nerve system and it was beginning to work on my nerves. Not with his driving ability, it was just that we were blowing tires because at that particular time, the tire company didn't have much of a tire rule and the tires were too big for the wheels we were using and we were busting a lot of tire beads." The tire problem is now history and so is the split between Owens and Pearson. "We're friends again," said Owens. Owens' last win as a driver in NASCAR Grand National Series racing came at Richmond on September 14, 1964. News reports at the time said he ran the race because he loved to race on dirt. He was quoted as saying, "We're running fewer and fewer dirt tracks on the Grand National circuit these days. That's a shame. I don't care anything about driving on asphalt. I just did this for fun." While he probably said that at the time, he adds now that he was also trying to make a point with his young driver. "I was learning him the ropes at that particular time," explained Owens. "I had to come out of retirement up at Richmond, Va. on a 300-lapper, which was 150 miles, one Sunday afternoon to show him that I could still beat him, because he wouldn't listen to the pit crew. "He'd run so much on dirt short race tracks he didn't need nobody; he just raced hard and he wouldn't preserve his equipment and so forth," continued Owens. "I told him, I can beat you because you won't let the crew help you. And he didn't believe that, but after the race - I won the race and he run 2nd - he started believing us and he started to come on as a winner. "I showed him two weekends in a row there - I run a first and a second, and I had the second one won, but my brakes started locking up with about three or four laps to go on a race track that you strictly had to rely on brakes. Ned Jarrett beat me and I said, 'Heck with it, I quit.' I had a first and second out of retirement there in 1964 and I didn't get back in another one." Some years later, Sports Illustrated named Pearson its NASCAR Driver of the Century. The voting by a panel of 40 experts was very close and Pearson edged seven-time champion Dale Earnhardt by two votes. A first-place vote by Owens put Pearson on top. "He was always the best," said Owens of his friend Pearson. "He's a champ. I talked to John Holman, who was a founder of Holman-Moody, about Pearson and told him, 'He's one of the best.' He (Pearson) put Holman-Moody on the map there; him and (Fred) Lorenzen." After he retired as a race car owner, Owens stayed in the game by building drive shafts for Dodges. "At one time, I guess I was building 75 percent of all the drive shafts that was racing in NASCAR," explained Owens. "I just gradually got out of that because competition began to get greater and I just faded out of it." Owens still goes to work daily at the salvage operation he runs in Spartanburg. Loyal to the brand and company that helped make him one of the all-time greats in modified and stock car racing, Owens accepts only Chrysler products at his business. His business now has between 1,200 and 1,500 Chrysler, Dodge and Plymouth cars. "When Chrysler decided to come into racing, I went with Chrysler," said Owens. "And then as they began to curtail back out of racing, I accumulated a whole bunch of Chrysler cars and only had a certain amount of space. So I said I'd open up a wrecking yard and specialize in Chrysler, because I only had three or four acres at that time. Since then, I've gained and have 12 acres of Chrysler cars now." Owens says there aren't any race cars in the yard but he does have two Dodges in museums. "I put one car in the museum in Darlington - one of the needle-nose cars, the one that we actually ran at Talladega. They have Marty Robbins' race car at Talladega. Of course it belonged to Marty, but I sold it to him and maintained it, and I fixed it at the museum down there. Marty was extra good to work with - a real nice guy." Owens also built cars driven by Buddy Baker. They won several races together, but one of their most memorable events won't be commemorated in any museum. It was at Texas International Speedway in 1969. "We didn't win the race because he (Baker) run over a car on the pace lap with 20 laps to go and three laps in the lead," said Owens. "He felt bad. I did too. We had already pulled him in, changed the tires, washed the windshield and wiped the car down. That's how much better we were than anybody there that day. When he run into the other car, that put us out. It was so bad, I was so disgusted, I came back and cut that car up. Cut it up into pieces - sure did." The therapy must have helped because Owens and Baker stayed together and enjoyed some great racing moments. "We had some bad experiences and we had some good experiences," explained Owens. "We won Darlington together in 1970, and that's also the year they put me into the Hall of Fame there, just before the victory." Owens was inducted into the Hall of Fame Saturday night, and Baker won the Southern 500 the following Monday, which was Labor Day. "Buddy was real easy to work with," said Owens. "I respect him as a great driver. He did a lot of test work and he was very likable." One innovation Owens introduced to NASCAR has since become a racing standard - the rear deck spoiler. The first one was relatively small but it cured a handling problem. "We got to Daytona, and Lee Petty and me were good friends, and he come up to me and said, 'Cotton, you all got us this year.' I said, 'What you mean, Lee?' 'Well, you all got the speedway car.' I said, 'Well, we may have a speedway car, but that car might not turn when it gets down there to the corner.' I said, 'It might be too loose for the driver.' And sure enough, it was. "They (NASCAR) let us have about an inch-and-a-half spoiler on it, then Pearson liked the car," said Owens. "Up until then, Pearson just hated that car. In fact, he drove the two-door car there when (Mario) Andretti drove the Dodge Charger in 1966. "The spoiler did it for him (Pearson). It put some weight on the rear end. We got 15 wins that year, four of them consecutive. And we won the championship." His primary sponsor that year? 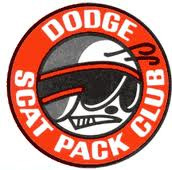 The Southeastern Dodge Dealers. Sounds similar to today's situation with the Evernham Motorsports Dodge Intrepid R/Ts being sponsored by the Dodge Dealers. "The Dodge people gave us pretty near everything we needed," said Owens. "We had a lot of good relationships. I was responsible for a lot of the stuff that helped improve the engine, that I'd found through the dyno I had here. I helped them just about as much as they helped me. "Of course, I did what I was supposed to do - try to win races, and that's all they asked," continued Owens. "I thoroughly enjoyed the Hemi engine because I'd go to the race track and practice with the engine, run the race, crank it up, load it on the trailer, and bring it home. It was that durability that really made it a better engine than other engines. The durability was there, and we set a lot of records at different places with it." Those records will forever link Cotton Owens and Dodge in the record books. 7/21/64 - David Pearson and his Cotton Owens-prepared Dodge won the Pennsylvania 200 on the half-mile dirt track at Lincoln Speedway, New Oxford, Pa. Pearson was the pole sitter but Bob Welborn got the jump on him at the start with his Holman-Moody Ford. Pearson patiently waited for the right opportunity to take the lead, which came on lap 126. Welborn's engine expired a little more than 40 laps later. Richard Petty finished second, 11 seconds behind.